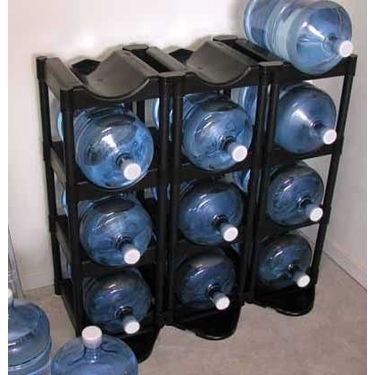 The complete Bottle Buddy bottled water storage system offers you storage for twelve 5 gallon water bottles. The Bottle Buddy system is made of high density plastic wells to hold bottles securely in place. Each tray holds 50 pounds, individual shelves snap together so you can create your own custom bottle storage system, maximum height is 5 shelves. *Floor protection kit (drip tray) and twin cap & connector stabilizer kit shown in this photo not included. May be purchased separately.